A self-refining liquid control game uses player analytics to guide precomputation to the most visited regions of the liquid's state space. The game's quality continuously improves over time, ultimately providing a high-quality, interactive experience. 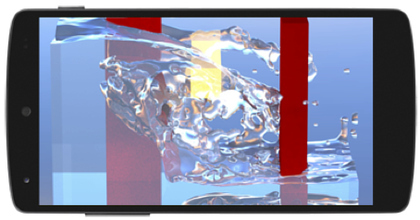 Our data-driven approach enables detailed real-time simulation and rendering of free-surface fluids on a mobile device. We represent a game as a state graph, where each edge is a short video. Gameplay consists of traversing the graph. Player edge traversal frequencies predicted using our StateRank algorithm and learned player model (above) closely resemble observed edge traversal frequencies (below). ACM Transactions on Graphics, 33(4):73:1-9, July 2014. Proceedings of ACM SIGGRAPH 2014, Vancouver. Data-driven simulation demands good training data drawn from a vast space of possible simulations. While fully sampling these large spaces is infeasible, we observe that in practical applications, such as gameplay, users explore only a vanishingly small subset of the dynamical state space. In this paper we present a sampling approach that takes advantage of this observation by concentrating precomputation around the states that users are most likely to encounter. We demonstrate our technique in a prototype self-refining game whose dynamics improve with play, ultimately providing realistically rendered, rich fluid dynamics in real time on a mobile device. Our results show that our analytics-driven training approach yields lower model error and fewer visual artifacts than a heuristic training strategy.